Whenever a creature attacks enchanted player, put a +1/+1 counter on it. Forgotten Ancient is marvelous if combined with all the other creatues that obtain free counters, like Managorger Hydra . Primeval Bounty if you have a good amount of noncreature spells. Hi! So, I'm not sure if you want input on this deck or not, but I'm going to offer some anyways. First, lets get this out of the way: Unfortunately, this deck is not modern legal, because Atraxa, Praetors' Voice and Curse of Predation have not been printed in any modern legal sets. I'll start with the good things: these are predominately good magic cards. A lot of people tend to try to make decks that ultimately are just lacking strong effects. Your sideboard is pretty well built, although I'm not sure what the "Dread Decks" you are referencing in the description, it contains a good mix of graveyard, aggro, midrange, and control hate. 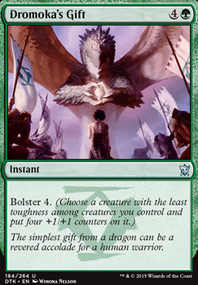 Additionally, Hardened Scales is strong, and it looks like you've got a fair amount of cards that synergise with it. (Sorry for all this text, especially if you already know this.) Now onto the stuff that could use tweaking. The enchantments. A lot of them are sweet, but unfortunately really aren't very useful. Alpha Authority is strong, but usually won't really effect the game state, or at least not in a meaningful way if you look at how powerful modern decks are. Curiosity can be reasonable, but typically is only good on cheap creatures with evasion. In this deck, the best you can do with it is play a two-drop, next turn enchant it, and hope that your opponent has no blockers or removal by turn three. While not necessarily bad, it is almost always a worse Serum Visions. Having played with Aether Vial a fair amount, I think it's safe to say that it doesn't belong in your deck. Most vial decks want to use it for two things: to accelerate out cheap creatures, or to "flash" in creatures with disruption abilities at instant speed. 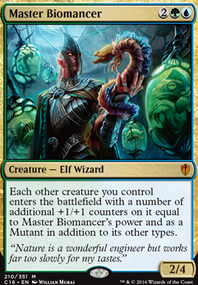 Also, most vial decks want to run thirty-ish creatures, so that vial is always good. Currently, Chromatic Lantern probably should be in this deck, but not for the right reason. Your land base is really inconsistent. Instead of using Reflecting Pool, Mana Confluence, and filter lands, you should try a combination of "fetchlands", like Windswept Heath, Verdant Catacombs, or Marsh Flats, and "shocklands," those being Overgrown Tomb, Temple Garden, or Godless Shrine. 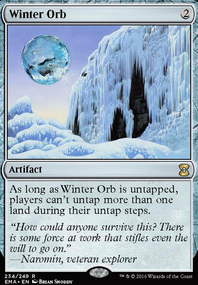 These together with fetchlands are incredibly strong, as you can fetch up any color of mana the deck uses, and thin your deck,slightly decreasing the chance of drawing lands in the future. 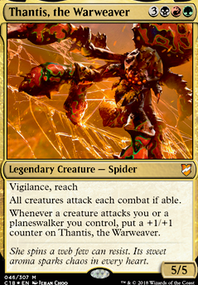 The real issue I see with this deck is that it doesn't really know what it wants to be. You have midrangey creatures, aggressive enchantments (kinda), slow artifacts, +1/+1 counter synergy, life gain synergy, etc. I would try to pick one of those things, and make the whole deck built around it, which means getting rid of all the random two-ofs. Arguably more important than raw power in modern is consistency, and this deck has no real card advantage spells, and too many different things. My suggestions for cuts are plentiful. However, Kresh the Bloodbraided comes to mind immediately. 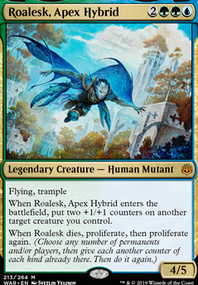 Reyhan, Last of the Abzan would be good, Ob Nixilis, the Fallen is great, Rockslide Elemental is similar to Kresh, Taurean Mauler is another Managorger, and Yahenni, Undying Partisan and Malakir Cullblade, with even more similarities to Kresh, may fit well with your flavor. 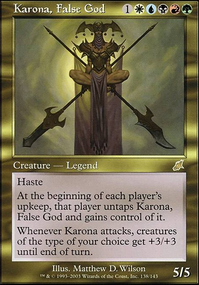 Curse of Stalked Prey could help, alongside Curse of Predation, some mana rocks would do you good, Apocalypse Hydra, and many other hydras would be decent finishers, Kalonian Hydra takes the cake though. Armorcraft Judge is nice, along with Inspiring Call, Pelt Collector and Experiment One, Champion of Lambholt, maybe Heroes' Bane, Ravenous Slime, Rubblebelt Raiders, Deus of Calamity, Scute Mob, Sporeback Troll, Tuskguard Captain, Vinelasher Kudzu, Soul's Majesty, Falkenrath Exterminator, and Stromkirk Noble? So that's a few suggestions. Want me to propose cuts as well? Hey, saw your forum topic asking if any recent cards are worth an upgrade in any of your decks. Out of all your decks this one in my opinion has the most potential for upgrades. Even just with cards that are already in Magic, not ones that were in recent sets. You seem serious about upgrading this deck therefore most of my suggestions won't be budget cards. Oh this is a fun one! What is your goal with this deck? Spit out tokens and make them big? The only thing you have to worry about with her on the field are mass destruction and mass sac effects like Dictate of Erebos. I would consider Eldrazi Monument, Mother of Runes, Rune-Tail, Kitsune Ascendant,Hero of Bladehold, Crystalline Crawler, Hangarback Walker, Mindless Automaton, Bloodspore Thrinax, Bramblewood Paragon, Hardened Scales, Curse of Predation, Gyre Sage, Walking Ballista, Cradle of Vitality and maybe Oreskos Explorer, Sun Titan, Gift of Immortality, Sunbond, and Prowling Serpopard. Sorry, I felt like maybe I was listing abit I don't want you to feel like I'm trying to build your deck. I know it can take the joy out of building for some people :) Anyway, good job so far and happy tuning! Manabase is way too slow, especially for a 5 colour deck. Needs more ramp spells, mana dorks, and lands that enter untapped. There are easier ways of casting your whole library than making everything into Maestrom Nexus. Jace's Archivist + Mind Over Matter + any infinite coloured generator (assuming you have your commander out) plays your entire library if you want, or just run with Laboratory Maniac and mill yourself. Extra combat damage concept is a strange one if you don't have many blockers or ways to stop people from attacking you. 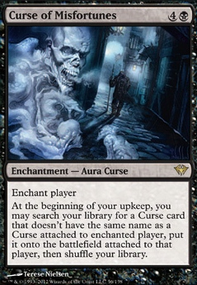 Consider Ghostly Prison, Propaganda, and similar effects, as well as curses that make people want to attack the enchanted player (Curse of Predation, Curse of Bounty , etc.). Also run Edric, Spymaster of Trest for the same reason. Extra turns are always good, but without a win condition they're wasted.